I have never been a big fan of yellow flowers and, as much as I love roses, yellow would not be my first choice either to grow or to use in an arrangement. That said, having inherited a rose in my front garden that is resplendent at this time of year with the most beautiful, scented, huge-yet-delicate, yellow blooms, I decided that I would learn if not to love then at least to appreciate them – with happy results. The use of colour and texture has the ability to change what could so easily look harsh or cold. 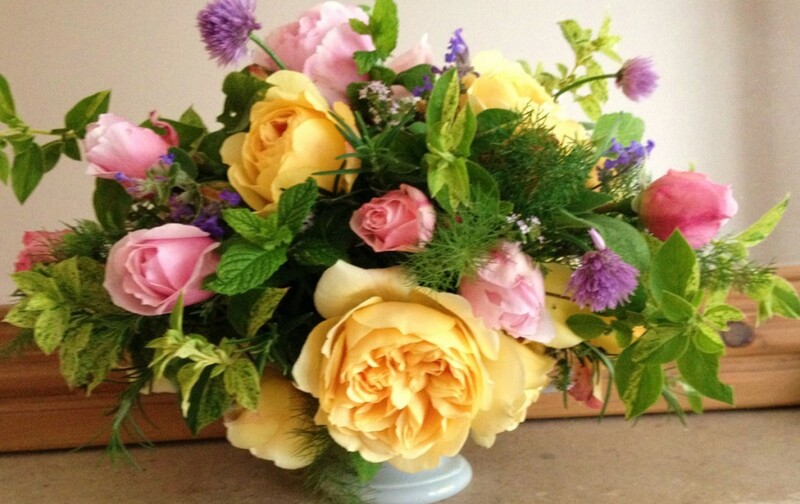 I wanted to use these flowers to create an arrangement that looks like it might have come from a country garden. I have used a beautiful pale pink David Austin rose ‘The Constant Gardener’, along with fennel, oregano, rosemary, mint, chives, thyme, Nepeta and variegated honeysuckle, all growing in my small south London garden.